And what is the upper left one? Up seems to be something based on the BMP-3, and the armoured truck with external 120mm mortar that is the second picture. There is more info about this project in this topic in the page 8. Surely no-one of the three will be finally adopted by the Russian Armed Forces. Like the project of the truck with external mortar of 120mm this project seems more for export, than for the Russian Armed Forces. In my view also seems below the current standards for the Russian Armed Forces. 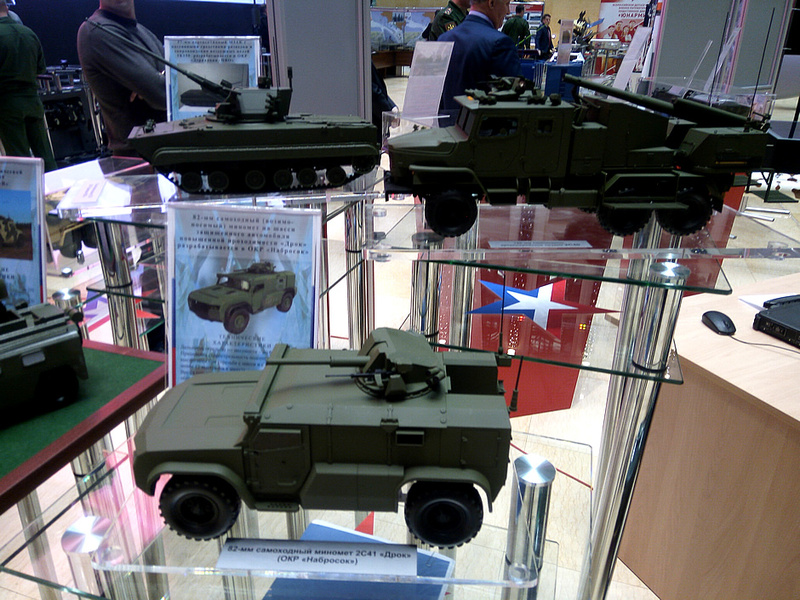 For me would be far behind the project of 120mm based on the new BMD-4M platform. Even I like more the current 2S23 and 2S9. The war means the end of these weapons in Russia. These weapons can be exhausted in Russia by the needs of the war in Syria. Some people see it as a problem for Russia, begin to think which weapons can succeed to them? Looking at the Russian arsenals in overall terms, I see not it as a problem, Russia has the necessary to move forward by two ways, self-propelled and portable/man-portable, with improvements over the heavy towed weapons in both cases. Cheking the links to the Russian wikipedia is possible to see in which aircrafts have been used these weapons. The last and most modern would be available for sure today, and is in production still (for the Yak-130), like the rest of the weapons of the GSh-23 (23mm) and GSh-30 (30mm) families of weapons. 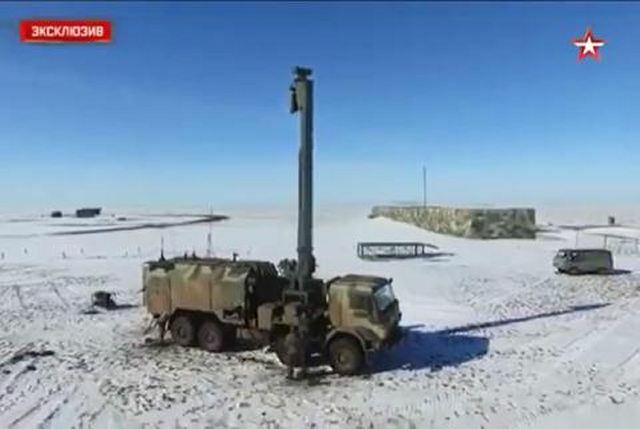 I wonder whether regular artillery units (Artillery Brigades) or standard motor rifle units (artillery units of motor rifle brigades/divisions) will receive this new radar. From May 25 to May 27, 2017, the Scientific and Technical Forum "Day of Advanced Technologies of Law Enforcement Agencies" was held at the training ground of the Research Institute "Geodesy" in Krasnoarmeysk, Moscow region. According to the web-resource "Made with Us", in the closed part of the exposition of the forum was shown, among other things, a 120-mm self-propelled mortar based on the armored vehicle "Tiger-M". The developer of this complex is JSC "Central Research Institute" Burevestnik "(part of JSC" NPK "Uralvagonzavod"), the manufacturer - PJSC Motovilikhinskiye Zavody (Perm). Any mention about how it is loaded? This was a very interesting picture, and more still now that we know what it was. No-one of them seems a strong solution for the Russian Armed Forces. 120mm initially reported as 2S36 Zauralets-D. The current reports talk about different thing. For small light forces... ie airborne, or naval infantry, or recon units with typhoon based vehicles a light mortar armed vehicle would be very useful and be able to carry more ready to use rounds than a heavier calibre like a 120mm weapon. The 82mm gun would be an excellent choice in that its HE fire power would be impressive along with its direct fire accuracy and the number of rounds such a small vehicle could carry would make it an excellent choice. It actually wasn't that long ago the US military actually tested a humvee with an 82mm Vasilek auto mortar mounted on its back. Regarding the 57mm gun mounted on the BMP-3... the 57mm gun will be a potent light anti armour weapon, but also be useful for anti aircraft use and even an anti ambush or convoy protection calibre that could be used in a range of situations where there is no need to have a particular chassis or vehicle family. An airbase needs air defence vehicles but could also come under ground attack in a COIN type situation... nothing will smack down an enemy drone like a 57mm guided shell, and nothing will stop an armoured truck like a 57mm unguided SAPHEI Frag shell. It might be the only tracked vehicle on the base so it does not need to be a Kurganets or Armata based vehicle... there is no logistics train so parts can be kept on site to keep it running... it would likely be cheaper than a more modern vehicle family. Taking into account that many (more than a 60%) of the projects with 2S designation reached not active service in the Russian Armed Forces, I do not think the 2S38, 2S40 and 2S41 will be between the projects that reach active service in the Russian Armed Forces. Said it I do not expect a public rejection to damage not the prospect of these projects to export. Between the recent projects I expect a success of the 2S35, 2S42 and the Sprut SDM-1 (that likely can have also its own 2S designation). I also expect future successful projects based on the Armata, Kurganets and Bumerang platforms. I have some doubt about some option (125mm antitank or 120mm indirect+direct) based on the Typhoon 6x6 platform. I'm not sure if necessary. Sprut wont get a 2S# designation because it is not an artillery vehicle... it is a light tank. It should get a T-## designation. I agree with the 125mm calibre, and the 120mm is too big for a four wheel vehicle but for a six wheel vehicle the 120mm weapon should be fine. The question is what they expect from their light recon forces... high speed, high mobility and high fire power... the question is, do they need a 125mm gun and 120mm gun mortar calibre. I rather suspect the HE power of the larger gun would be useful but the high velocity rounds would be less useful against the medium to lighter targets a recon unit would come up against. The 120mm would be useful against solid targets but if an enemy MBT is encountered missiles would be a better simpler option. 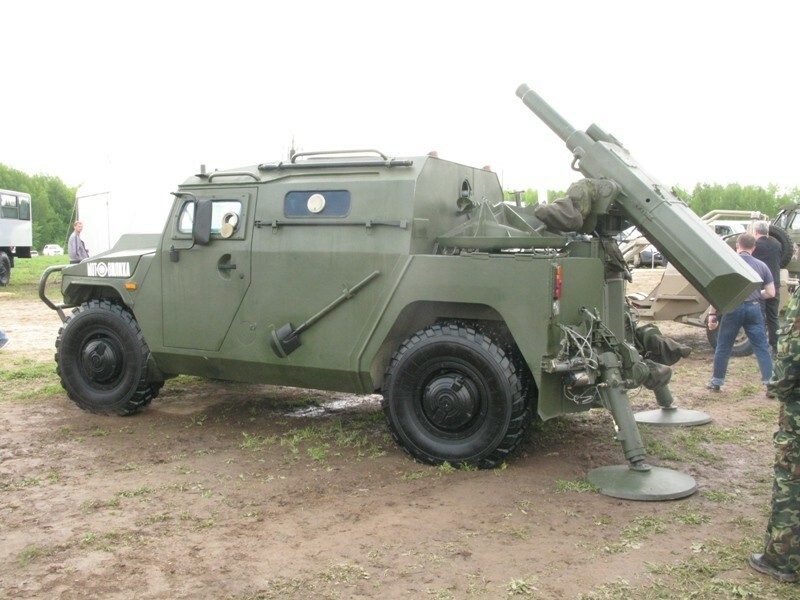 The accuracy of direct fire 120mm shells would make engaging many hard targets like bunkers easier than using missiles, but then highly mobile recon units should have CAS support and long range artillery support from 70km range 152mm guns to Tochka and Iskander, so fire power should not be a problem. 57mm high velocity direct fire guns will be very potent too. I believe the Sprut is designated as an SP anti-tank artillery piece giving it the 2S... code. The addition of bmpd. 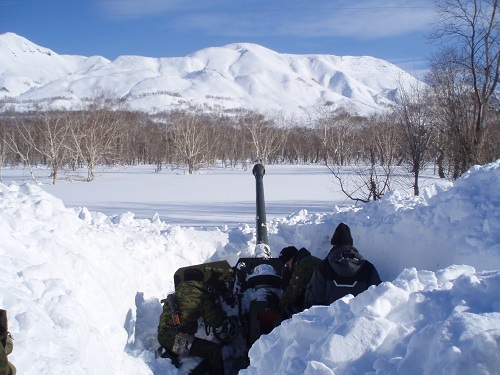 Up to now, 100-mm CS-19 anti-aircraft guns and BS-3 field guns, as well as mortars of calibres 120, 160 and 240 mm, were used to equip the Roshydromet anti-avalanche service, and one 152-mm 2A36 "Hyacinth-B" cannon is used in Kamchatka. , and D-30 howitzers were absent. The D-30 is a very impressive weapon, but it is a calibre that could be replaced within the Russian military without losing too much in terms of capability. I remember reading that at max range of 15km its circle of impact, or CEP where most rounds would land if there are no faults with the ammo or gun was about 60m long and just under 10m wide, which is rather impressive accuracy in my opinion. The fact that they are being transferred to units trying to start avalanches to improve public safety suggests they are reserve weapons now and will gradually be withdrawn from service. I have seen footage of recoilless rifles being used for the same role too... the SPG-9 in particular. The D-30 has the advantage of 360 degree traverse which would make working with snow drifts in different places much easier without having to move the gun each time. Then, this mean an exit of these pieces of the Russian Armed Forces, to go to a gouvenrmental agency that will use them for civil purposes, not military. In fact this is a decommission. what a civil service will do the howitzers? George1 wrote: what a civil service will do the howitzers? They are used to start controlled avalanches in the mountain areas. Uraltransmash is to refurbish (& upgrade?) all reserve stock(>400) Tyulpan (2S4) self-propelled 240mm mortars for the MoD by 2020.16 Tyulpan (2S4) have been refurbished & upgraded so far.Undisclosed no.of Pion (2S7) 203mm SP guns are to be refurbished too. Though the fact that they are being refurbished suggests my earlier speculation of heavier weapons for Armata brigades/divisions is probably wrong. With new 152mm guns reaching 70km with standard guided rounds most targets would not need such specialised weapons. Having a reserve of those weapons however would be useful, especially if the guidance kits can be attached to those rounds too making them much more useful. 152mm rounds are generally in the 40kg payload weight range, while the 240mm mortar rounds can weigh between 100 and 130kgs, and the 203mm rounds in the 110kg weight range over a much greater distance than the mortar rounds. George1 wrote: Uraltransmash is to refurbish (& upgrade?) all reserve stock(>400) Tyulpan (2S4) self-propelled 240mm mortars for the MoD by 2020.16 Tyulpan (2S4) have been refurbished & upgraded so far.Undisclosed no.of Pion (2S7) 203mm SP guns are to be refurbished too. This is also good news for Russia. Both calibers are useful, and are likely to remain, because are not redundant. I do not think this affects to potential future weapons of these calibers. franco wrote: MOSCOW, Nov. 17 - RIA Novosti. The Russian Defense Ministry will maintain 122-mm self-propelled howitzers 2C1 "Gvozdika" and modernize them, equipping an automated management system, the Izvestia newspaper reported on Friday. "The military department is discussing the modernization of the" Gvozdik "with the representatives of industry.The decision to modernize is taken in light of the successful use of self-propelled howitzers in almost all armed conflicts of recent times, including in Syria." Carnations "kept mobility in a highly rugged terrain, where heavier self-propelled guns could not pass, "the article says. It notes that after a thorough modernization the crew will only have to press the button, so that the system itself made the calculations, put the gun on the target at the given coordinates and determined the necessary number and type of ammunition. Howitzers will also receive shells of increased power and accuracy. "The military department in the near future must finally decide on the tactical and technical task for the modernization of self-propelled howitzers, the number of artillery installations to be converted and, consequently, the price of the issue." It is expected that one of the enterprises of NPK Uralvagonzavod, - the report says. According to the publication, "the highlight of the updated self-propelled artillery systems (SAU) will be an automated guidance and fire control system that will minimize crew participation and increase fire efficiency." The self-propelled guns should receive a more advanced ballistic calculator of the sighting complex, new sights and, possibly, a new chassis domestic production. " Just at the begin of this page it was a discussion about the future of the 2S1. As expected the 2S1 will continue long time in the Russian Armed Forces. And, as if by coincidence, today's subject in the Chasavoy program was about the Tyulpan and Pion heavy artillery. And AFAIK, this is the first time we are seeing the 240mm laser guided round SMELCHYAK of the 2S4 Tyulpan mortar.